Getting stuck driving in heavy rains can be a scary experience. Your car could hydroplane, it’s harder to brake quickly and accidents are much more common. 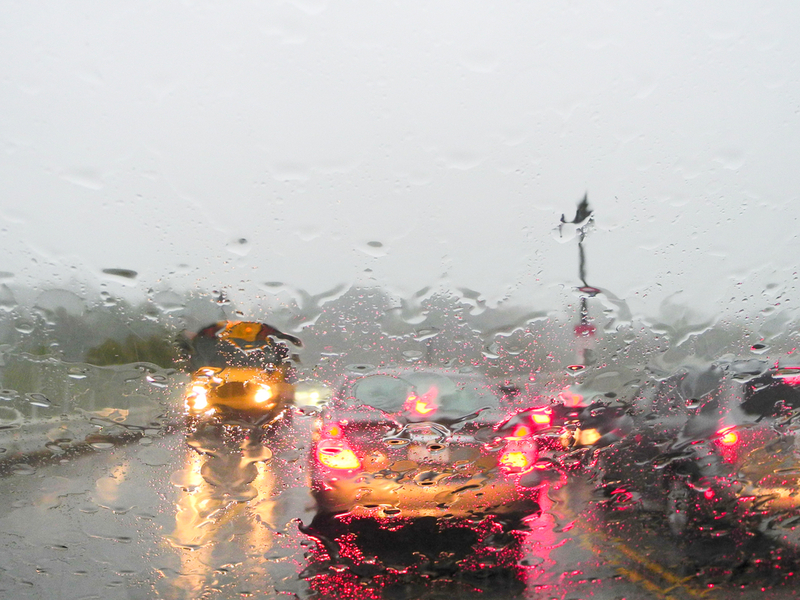 Here are some tips for safe driving in a rainstorm. Rain reduces visibility on the road, making it harder to see approaching cars and judge distance. Headlights (not bright lights) will help other cars see you more clearly. Many states also have laws that require drivers to turn their lights on whenever the windshield wipers are going. You should always drive at or even below the speed limit when it’s raining, especially on the highway. Slowing down will help you avoid hydroplaning and will make it easier to brake if there is an incident on the road. Tailgating cars and riding bumpers is always dangerous, but it’s particularly bad during a storm. Water on the road makes it harder to stop safely. Your car will slide more on the water, and you might skid if you brake too quickly. Increase the distance between you and the car in front of you to avoid an accident. When it starts pouring rain and visibility is drastically reduced, many people turn on their flashing hazard lights, thinking that will make it easier for other drivers to see them. This is extremely dangerous, and illegal in many states. Hazard lights signal that your car is stopped and can be confusing for approaching cars. If at any point you feel unsafe driving in any type of weather, pull over and stop driving. Get off the road or highway and find a parking lot, gas station or restaurant and wait out the storm. If you do happen to be stopped on the side of the road, use your hazard lights. This entry was posted in Top Driver Blog and tagged adult driver's ed, Car Safety, Driver Education, Driver School, Driving, Driving in the Rain, How to Drive a Car, Road Safety, safe driving, Teen Driver, Tips, Top Driver.